RECRUITING: Can Jones Really Do Everything? Every once in a while as a reporter that calls football prospects, I run into one of those prospects that just seems to be able to do anything he wants on or off of the field. This year, that do everything player may be Oklahoma City (OK) Millwood quarterback Gerald Jones, who is also a great student and a dunk/scoring machine for a state championship basketball team. Put a ball in his hands and Gerald Jones becomes electrifying, whether it’s a football or a basketball. Great things just have a habit of happening when Gerald Jones has the ball. Put a book in his hands and he becomes the quality student. He’s ranked tenth in his high school senior class academically. It makes you wonder if there’s anything this guy can’t do? Led by Jones, Millwood is loaded this year and looks to make a trip to the state championship. With a four-year hiatus since their last state title in 2002, Millwood could go all the way behind Jones, who has some guns to work with on offense. The line of scrimmage is often cited as the place that championships are won. Jones appreciated his Hog-mollies that protect and block for him and he clamors about the big boys that create havoc on defense too. The rest of the defense should be stout also. Offensive skill is probably where Millwood will dominate people from. The weapons are probably just too much to counter with when they face other opponents. Last season they attacked mostly by the ground. This year Millwood is planning on using the speed on the outside to go downfield and make life utterly miserable for their defensive opponents. As impressive as Jones is as a leader for a big time team, he is a great student athlete away from the gridiron. It certainly seems like the sky is the limit for this guy. For as shifty as he is on the football field, Jones likes to play basketball at the rim and not in open space. Although he plays with style and finesse, he also likes to mix it up inside a bit. Last season, as a junior, he averaged 24 points, 4 assists, and 6 rebounds. For Jones it is a busy life going from one sport to the next and spending time studying for his classes. With all of this on the table, it is a wonder he could find the time over the summer to visit some college campuses and see what they may have to offer. All of those schools are within driving distance and Jones felt that he owed it to himself to check out as many schools close to him as he could. He will spend time in the fall getting to know schools a little farther away. One of the schools that Jones is really interested in is the University of Florida. 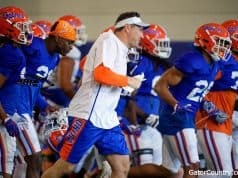 The Gators play a wide open style of offense and it is really what Jones is looking for. For Jones there is a great deal to like about the Gators, who are recruiting him as a wide receiver. In recruiting sometimes there are questions that are just dying to be answered. As far as Jones goes, I wanted to know just how he became interested in the Gators all the way from the heartland and Oklahoma City. 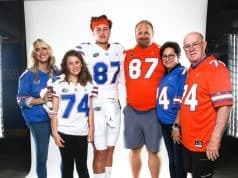 And the uniforms triggered Jones sending a highlight tape to Gainesville where the University of Florida coaches could not help but be very impressed. “My sophomore year I got no looks at all because my tape didn’t get out,” he said. “My junior year we put together a highlight film and he asked me where I wanted to send it and one of them was Florida, so he got the number and they were interested. With Florida already down as one of his stops for an official visit, Jones knows two more places he will likely make a trip to in the fall. Two other schools with more of a local flavor about them are very high on his list also. Oklahoma State and Texas Tech have a lot of what he is looking for, but are close enough that he probably won’t visit them officially. 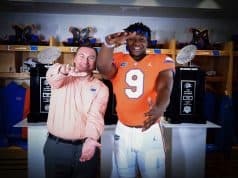 Having spent a great deal of time talking about Florida, he also talked about a myriad of things he liked about the other four schools on his list. Whatever school lands Jones will most likely impress him with showing him he will mature as a player, a student, and a man more than he would by going anywhere else. It isn’t just about winning on Saturdays. It boils down to these things for his college choice. And in turn the college of choice will get one heck of a person and a bonafide superstar of a football player. Gerald Jones is the kind of kid that when he says it, you just don’t doubt that he can do it.